Since it seems to be feasible using current technology, it is possible that Project Orion might be built one day. Of course it hasn't been built yet! A number of concepts based on Orion, or incorporating similar ideas have been proposed by various researchers. Some of these have been suggested as improvements, and others have been proposed as a way of avoiding legal issues about using nuclear weapons as a means of spacecraft propulsion. The feasibility of many of these variants remains unclear. Project Daedalus was a 1970s study by the British Interplanetary Society (BIS) for a "plausible" unmanned interstellar spacecraft propelled by a fusion rocket drive, using current or near future technology. The spacecraft was designed to be capable of reaching 12% of the speed of light, and was to include 50,000 tons of fuel and 500 tons of payload. The fuel was to be pellets of deuterium and helium-3, the latter mined over a 20 year period using robotic factories suspended from hot-air balloons placed in Jupiter's atmosphere. Project Longshot was a joint project by the US Naval Academy and NASA to create a design for an unmanned instellar space probe to be launched from Space Station Alpha (what eventually evolved into the International Space Station). Unlike Project Daedalus, Longshot was designed to be built using existing technology (although some development would still be required). 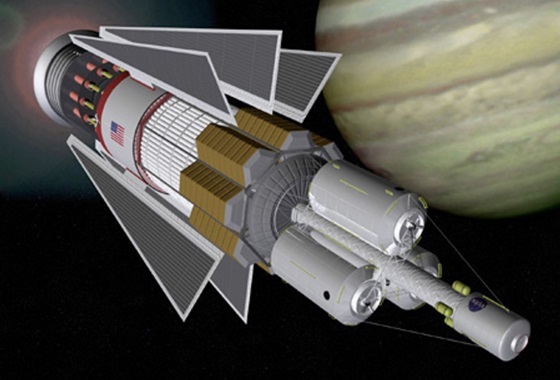 The spacecraft would have been powered by a nuclear fission generator, which would power lasers used to ignite deuterium/helium-3 pellets in a fusion reaction, which in turn would be used for propulsion. Since the 1990s, the nuclear engineering department at Pennsylvania State University has been developing ideas for spacecraft powered by fusion pellets, with fusion catalyzed by antimatter.